Designed for labeling all your DIY creations, Apothecary Neat keeps it simple with unadorned, homespun styling. Thin dividers neatly organize your information and make everything look balanced even when you leave areas blank. Your main text is set in condensed bold caps, reminiscent of turn-of-the-century wood type. A variety of supporting fonts complement each other perfectly. Italics add emphasis where you need it and a slightly angled retro font (in contrasting color) reads like a rubber stamp of approval. Apothecary Neat looks tidy and official but still feels warmly unassuming - just the ticket for labeling your best homemade goods. Available in 28 colors. Choose your favorite or mix and match from lights, darks, brights and neutrals - and proudly personalize your products with Apothecary Neat. 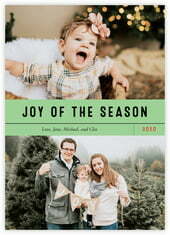 Customize your Apothecary Neat christmas photo cards today! 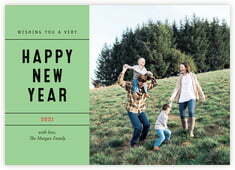 Apothecary Neat Christmas photo cards are flat, with the design on one side that allows room for your personalized text and your choice of colors, and coordinating design on the back. Evermine photo cards come with matching envelopes, beautifully boxed in their own specially designed packaging. And the cards are perfectly ready to use as is, or to be given as a gift. You can also have your envelopes printed with your return address in a letter style to match your cards too. Christmas photo cards measure both 5" x 7" vertically or horizontally, and you have a choice of four papers—our luxuriously thick signature white or cream, signature textured white, or shimmer white. Choose a color, shape and then select the green "Personalize" button to start customizing your Apothecary Neat Christmas photo cards with Evermine today!